Observation - MICRO MOTH LARVA UPDATE - UK and Ireland. Description: Moth larvshown in a previous observation http://www.ispot.org.uk/node/24279 I found I hadnt released this larva as planned it is now 15-16mm feeding on honeysuckle leaves I gave it.Markings more distict may be better able to id it. 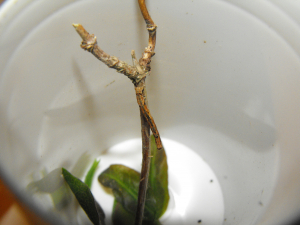 http://www.ispot.org.uk/node/24279 I found I hadn"t released this larva as planned it is now 15-16mm feeding on honeysuckle leaves I gave it.Markings more distict may be better able to id it.